NS provides sustainable mobility to more than 9 million passengers every year, which is its contribution to the economic development and accessibility of the cities and the regions, as well as helping Dutch climate objectives. The annual report tells you about the ways we are creating value for society. The value creation model below shows the social, economic and environmental resources we use, the value NS adds to them and what that then yields for society. 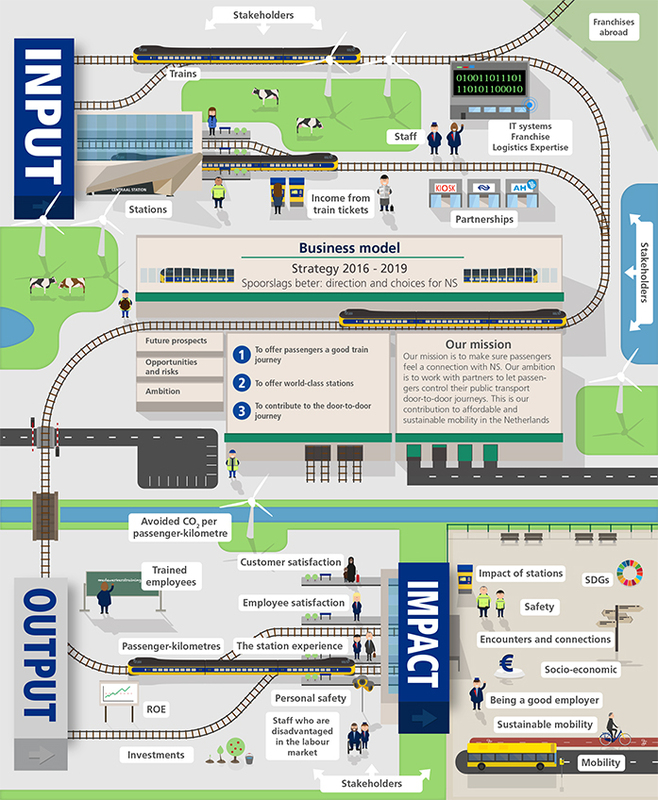 To let our business model function as well as possible, we need a number of key inputs. As a carrier, we could not for instance function without our people and their knowledge of logistics. But other aspects are important too, such as energy (e.g. from wind) for powering our trains. Our Spoorslags beter strategy puts the passenger in the spotlight. In addition, we have the objective of improving sustainable mobility in the Netherlands while at the same time running healthy business operations. NS focuses on three core tasks: providing a good train journey, world-class stations, and playing our part in the door-to-door journey. This is our contribution to affordable and sustainable mobility in the Netherlands. The activities in our business model have a variety of internal and external results. For example, in addition to our financial results, we carry more than 600,000 passengers a day in the Netherlands, we take good care of our staff and our trains almost always run on time. We have a major impact on our surroundings. Mobility is very beneficial to the Netherlands in economic and social terms. But customers also lose journey time when there are delays and we do exert an environmental burden because of the raw materials we use. If we are to be able to keep travelling in future and keep the Netherlands mobile, it is important for us to have insights into the effects our business model has on society and to keep using them as control parameters. This means that we can be sure that the social costs of a train journey remain less than for a car journey and – where the environment or safety are involved – we will be able to increase our social return by increasing our share in overall mobility growth.